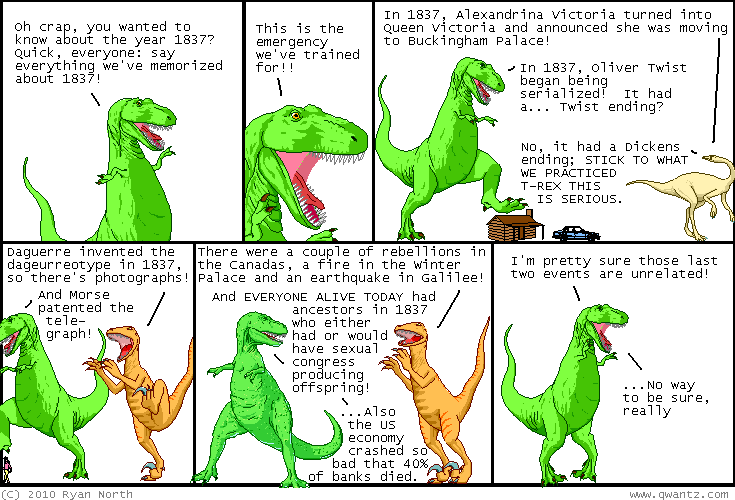 Dinosaur Comics - November 11th, 2010 - awesome fun times! –Wait frig I mean it's been a TINY bit too long since I've last seen him! November 11th, 2010: J.J. McCullough did caricatures of some of the Webcomics Weekend cartoonists and I'm totally there! Also Dave Kellett is working on a webcomics documentary with Fred Schroeder and they both interviewed a bunch of us there. Dave put up some stills from the documentary and HOLY CRAP, we all look amazing. The power of talented camerawork! Here's me and Karl (The Abominable Charles Christopher) and Katie (Hark! A Vagrant) and Emily (A Softer World) and Howard (Schlock Mercenary) and Chris and Anthony) (The Adventures of Dr Mc. Ninja and Nedroid)!